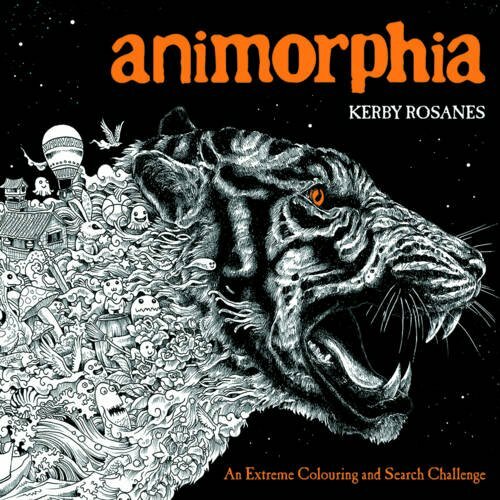 Kerby Rosanes is a freelance illustrator from Philippines. He's known for his intricate cartoon and fantasy doodles on sketchbooks. I've actually featured his drawing tools before. Animorphia is his artbook for 2015. It's a square format 96-page paperback filled with fun detailed illustrations. It's a book that's also a colouring book as well as a search book where you have to find little items hidden in the drawings. And also some of the drawings are left partially empty so that you can draw inside them. The artworks are all animal related. Usually there's the main subject that's accompanied by a myriad of cutesy cartoony characters. It somewhat reminds me of those Mattias Adolfsson illustrations that are packed with characters. There's a page with a list of items for you to find in the drawings. It's quite challenging to find them because the drawings are rather intricate and you really have to look closely. It's a fun book recommended to those who like doodles, sketches, pen and ink and whimsical goodness.